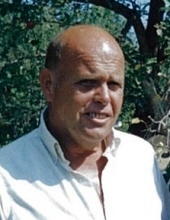 Burnham- Paul J. Muehlfeld, 68, died peacefully on April 01, 2019, surrounded by his family in Pittsfield. He is survived by his loving wife Mary “Sissy” Muehlfeld of Burnham; six children: Laura Muehlfeld of New Milford, CT, Christy Muehlfeld of Bethel, CT, Wayne Lydem Jr of Newport, Debra Brochu of Clinton, Steven Lydem of Garland and Jason Lydem of Waterville; eight grandchildren: Courtney, Tony Jr, Mikahla, Tyler, Chelsea, Alexa, Georgiana and Lilliana; one great grandchild, Tony III; brother, George Muehlfeld and wife Heidi of Danbury, CT; and nieces and nephews. To send flowers or a remembrance gift to the family of Paul J. Muehlfeld, please visit our Tribute Store. "Email Address" would like to share the life celebration of Paul J. Muehlfeld. Click on the "link" to go to share a favorite memory or leave a condolence message for the family.